The West Bank experiences significant climatic variation within a very small area. It lies within the Mediterranean climatic zone, which is characterized by winter rain and summer drought. Only the Lower Jordan Valley has a different transitional climate, between dry steppe and the extreme desert conditions of the Dead Sea region. Rainfall is limited to the winter and spring months, mostly between October and April. 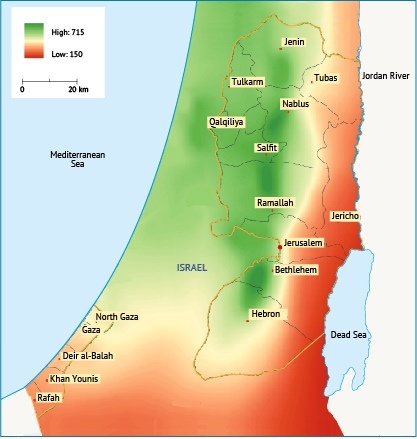 Rainfall ranges between 715 millimetres per year (mm/yr) in Ramallah (in the central part of the West Bank) and 145 mm/yr in Jericho (on the western slope of the Jordan Valley), and less in the Dead Sea area. The average annual rainfall in the West Bank as a whole is between 450 and 500 mm. The Gaza Strip is located in a transitional zone between the arid desert climate of the Sinai Peninsula and the temperate and semi-humid Mediterranean climate along the coast. Average rainfall ranges between 400 mm/yr in the north and 230 mm/yr in the south (Map 5). Map 5. Average annual rainfall levels in Palestine. Source: Fanack after ARIJ.